After a 6 day stretch at work I needed something really yummy, and potentially a bit posh (!) to perk me up- and keep me awake for the evening. At Middle Farm Shop I bought 2 partridges so adapted a recipe we do with quail- it’s quite funny as Colin has gone off chicken but really enjoys the more gamey little birds, especially when crispy and tasty. The partridge were simply roasted in a hot oven for 40 mins with a scattering of salt, pepper, olive oil and fresh thyme. I basted them from time to time as they can go a bit dry- but not these little lovelies- juicy and crispy at the same time! 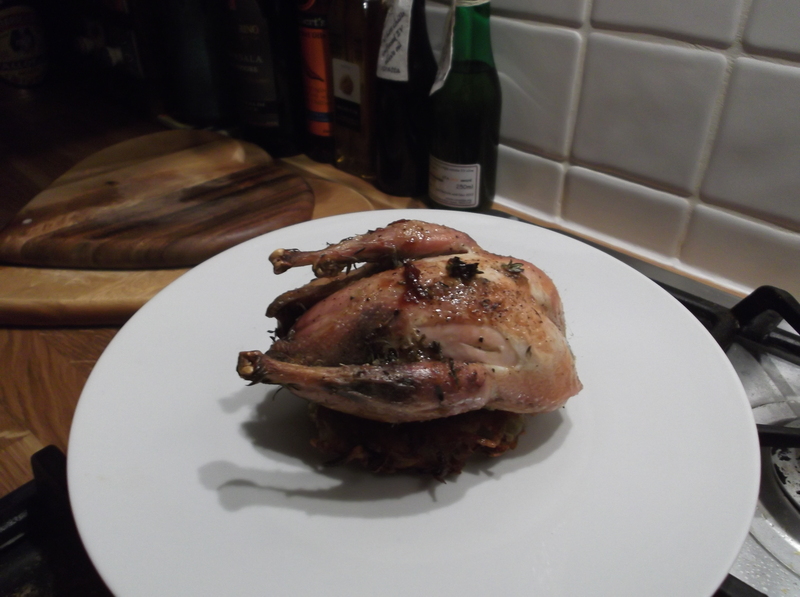 The partridge is sitting on top a latkes, adapted slightly from the Ottolenghi ‘Jerusalem’ book. grate the potatoes and parsnip (I do this in the food processor- lazy…), then squeeze out as much of the moisture as possible. Wrap in a clean tea towel to absorb the residual water. in a large bowl mix the grated veg, cornflour, egg white, herbs and a little salt. heat some olive oil in a large frying pan. Take a handful of the potato mixture and press into an almost burger shape. Fry on both sides until golden. Place on a baking sheet and cook in the oven for about 15 mins until crisp and cooked through. Enjoyed with a good bottle of Barolo, some crunchy salad (red and white chicory, radish and celery) and a lovely husband- who finished his plate. Just in after a late night at work- I am seriously fed up of driving having been all over the south of England this week! So, no dinner tonight as in too late. But I did have a very large piece of cake at work today, made for one of my managers last day. Yesterday was a much better day as I discovered a fantastic farm shop. It’s called Middle Farm, near Lewes and is on a working farm. The selection of meats, veg and yummy delights was fantastic and I came away with a box of happiness. We will be eating quite a few of my finds in the days to come! So last night we started with some of the sausages I bought- 2 kinds: pork with cracked black pepper, and pork with leek. I briefly cooked them in the oven until half cooked through then placed them on top of a bed of leeks, red onion, chopped flat leaf parsley and some sprigs of thyme. This I cooked in the oven for 15 mins until the veg was softened and the sausages browned. I had meant to make a sauce to go with this by mixing soured cream with strong mustard, but I forgot to buy the soured cream so it was served sauce-less! No worse for it actually! At lunch time I had some goats cheese that had been rolled in hot red chillis (bought from Middle Farm) with a salad. I am just so sad that I can not visit that farm shop every week! 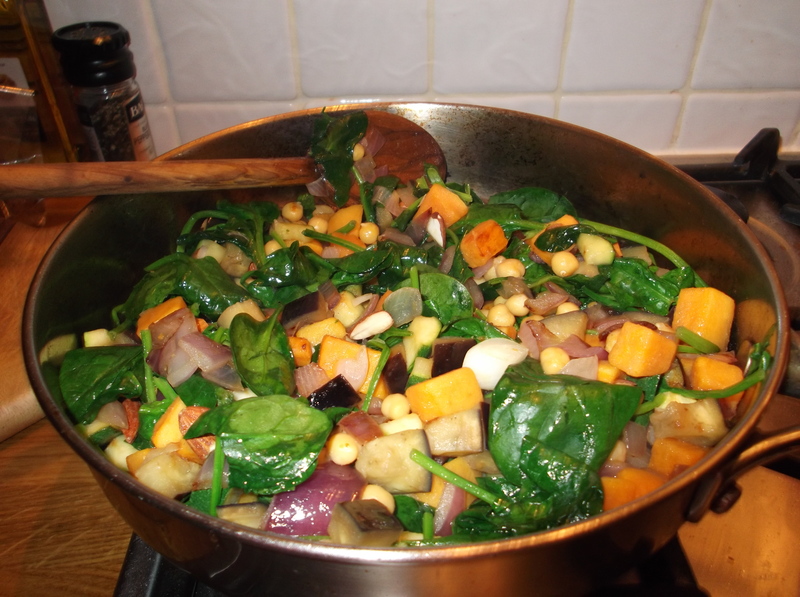 saute the onion, sweet potato, aubergine and courgette in olive oil till nicely browned. add the chickpeas and the spinach and stir through. stir in the almonds, spices and honey and take off the heat to cook slightly. with the pastry you can either lay it out flat and use it as a tart base, or cut into 4 smaller pieces. if making a tart simply spread the mixture on top of the pastry, folding the edges a little over the mixture, leaving it open in the centre. if making parcels hold the pastry in the palm of your hand and place the mixture on the pastry. Fold up the pastry, sealing the veggies, and shape into a ball shape. Cook either way in the oven until the pastry is browned- about 20 mins. Tonight I am back late as I went to meeting in Crowborough and had a horrible drive back- excuses, excuses, excuses- and Colin not back yet as trains delayed, so it’s a takeaway curry! Secretly pleased I have to admit so feet up, G&T and await some tandoori king prawns. I was supposed to be making Chicken Kievs, or what I like to call ‘like a Kiev’ (lots of herbs and butter but not loads of garlic) but saw that I had some good bacon in the fridge that needed using up so I made a stuffed chicken thing instead! I mixed a bit of salted butter with some chopped sage and parsley. 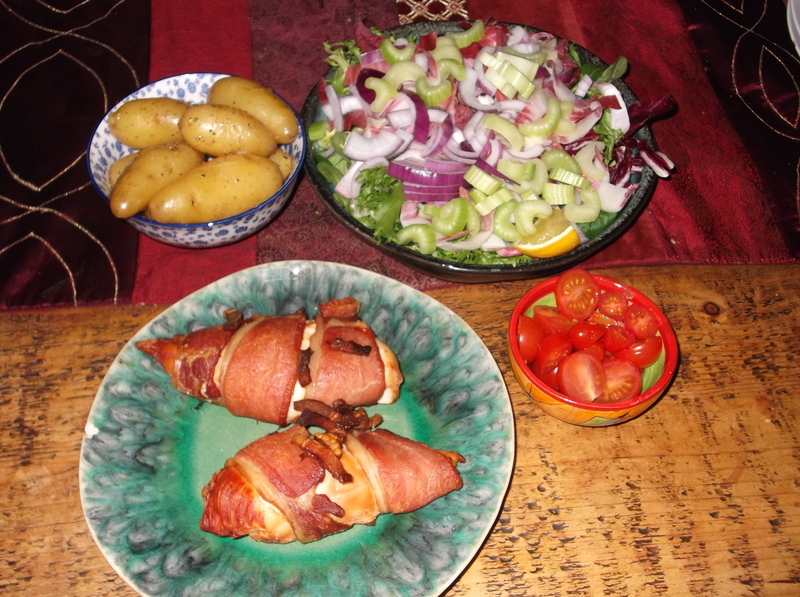 I placed this in a chicken breast and wrapped it up with some smoked back bacon- this was the Duchy Cherrywood Smoked Bacon which is delicious. I baked it in the oven for 20 mins. With it we had some crispy salad with celery and radish in it and some new potatoes. Really nice, marking the end of Christmas proper. I’m writing this on Monday night and it’s been a long day at work- and due to loads of sickness it’s going to be a very long week. I do feel quite righteous though as I did manage to get to the gym tonight, so the glass of wine I am having feels well earned! Tonight we have had a very satisfying dinner of meatballs (bought in I have to admit…), spaghetti and a tomatoey, chilli sauce. It was quite scary when cooking as I poured some wine into the saute pan after I had cooked out some garlic and chilli in olive oil and it caught and was burning! Smoke alarms went off and flat full of saucy aromas but it did have a good effect as sauce yummy! However, I will not be flambeing in my kitchen again in a hurry! I bit off a little more than I could chew when I decided I would make flatbreads- from scratch!- after work. It started out good as I left work on time, but then decided to pop into Kingston on the way home to do some shopping. I finally got back home after 6 and finally got around to kneading my dough at 7pm! This meant, inevitably, that shortcuts were made, rising times halved, and the flatbreads became more like crispbreads, However, they were tasty crispbreads, but I think in future I’ll stick to buying flatbreads or use pitta bread unless it’s my day off when I’ll actually plan time in to do the job properly! The flatbreads were to go with spicy kebabs which is a Saturday night favourite. I make the kebabs with lamb mince and spices and squidge into small sausage shapes. I used to use a variety of spices- cumin, coriander, cinnamon, chilli- but found a fantastic Ras-al-Hanout blend when I was shopping in Wholefoods in Kensington, and I now use this each time. The blend is perfect, a little hot, lots of cinnamon which goes so well with the lamb, and has pretty rose petals and spice galore. I doubt I could make a blend this good- or it would take forever and cost a fortune trying! I bake the kebabs in a hot oven for 15 mins until browned but still juicy. Alongside the flatbreads and kebabs we always have a little harrisa paste to spice it up further, a little greek yoghurt mixed with a chopped mint and parsley to cool it down, some crispy salad leaves and a red onion and tomato salad. I did sprinkle some pomegranate seeds onto the tomato salad which gave a great sweet/sour burst which worked perfectly with the kebabs. 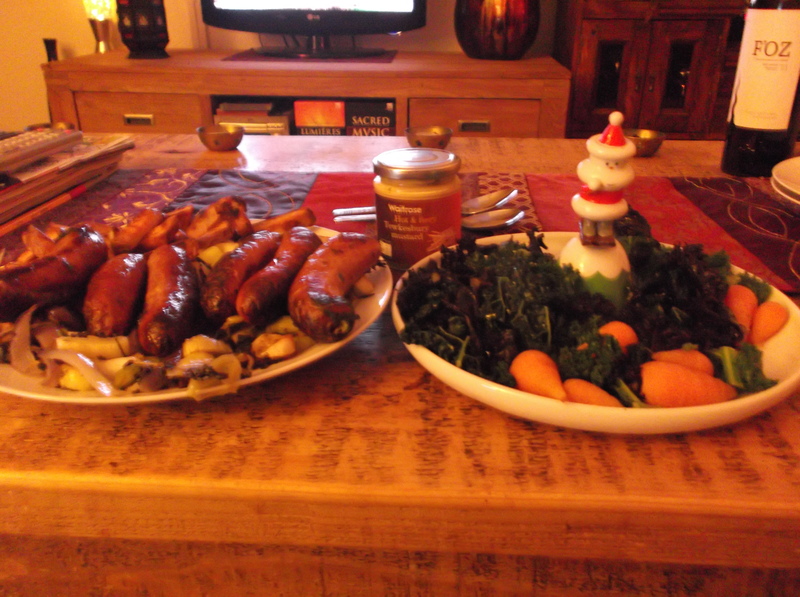 A really yummy dinner and one we will probably have many, many more times in 2013. Yesterday and today have been a tale of 2 curries! Last night was Colin’s curry night and he made 2 veggie curries- it is his New Years Resolution to cook much more often so this was his first offering of 2013. The 1st curry was a roasted veggie stew, with cauliflower, courgettes, carrots, onions and tomatoes. The 2nd was a spicy dal. As you can see Colin was stressed while cooking but it was a triumph, and I am so happy that there are leftovers for my late night at work on Friday! heat a little vegetable oil in a large pan and fry the mustard seeds, fenugreek seeds, chilli, curry leaves and ginger for 2 mins. add the onions to the pan and fry for 10 mins. add the chilli powder, turmeric, tomatoes and coconut milk, season and simmer for 30 mins till nice and thick. add the chunks of fish and poach in the yummy sauce until cooked- about 10 mins. sprinkle with lemon juice and chopped coriander. Tomorrow no new nice dinner as working late (got yummy leftovers)- but good plans for the weekend! I made this yummy dessert at the weekend to show off the great Alessi plate I got for Christmas- the mini meringue Snowmen are from Peyton & Byrne but really remind me of the John Lewis Snowman! Whipped cream, silver balls and popping candy made this the easiest dessert I think I’ve ever made, and definately one of the cutest! Today we started our day at my in-laws (The P’s) and came back with some very boozy Christmas cake their friend Margaret had made. I always think I don’t like Christmas cake but this reminded me of how good it can be- maybe it depends how much you ‘feed’ the cake!!! Dinner tonight was from my new favourite cook book- Diana Henry’s ‘Crazy Water and Pickled Lemons’. I’ve cooked 4 meals now from this book and I’ve only had it 1 week. Tonight it was some lamb chops, marinated for a couple of hours in harissa and lemon juice and then simply griddled till slightly charred. They were served on top of some spicy mash- potatoes and parsnips mashed with milk, cinnamon and cayenne. On top of the chop I added a dollop of onions which I had cooked till soft in olive oil, then added a little harissa and some fresh coriander. This we had with some sauteed leeks and celery (as Colin loves celery) which we served on the cute Alessi plate (he’s not just for Christmas!). 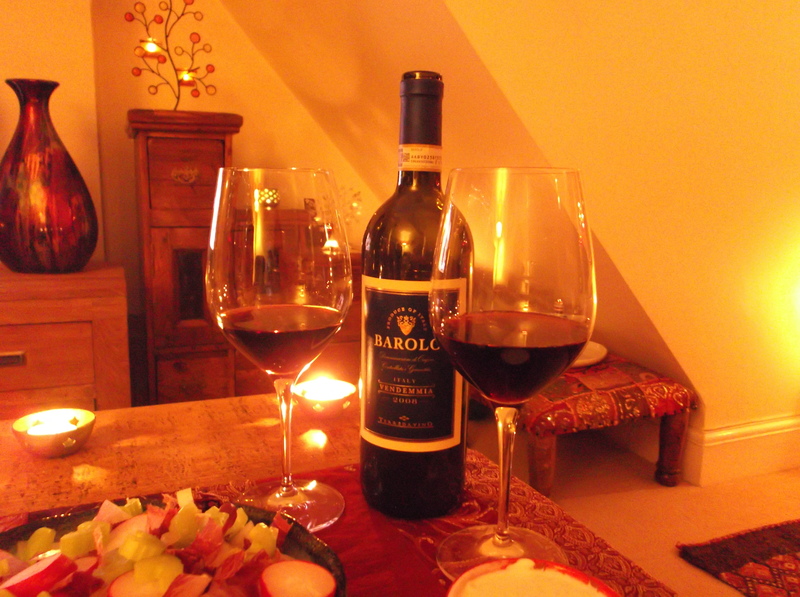 All washed down with a lovely bottle of Amarone. Here’s to 2013 and the best start to a new year.